The Sensor Configuration item in an Agent Group from the System Profile Preferences dialog box allows you to configure sensor properties. Only placed sensors can be configured. All configuration changes applied in this section apply to all connected Agents. You don&apos;t need to place sensor again, or restart your application. See Configuration Change Immediacy Matrix for more information. You can save or change related Sensor configurations. To use this, select OK and apply properties to other Agent Groups. Creating additional configurations in the General section of the System Profile lets you define multiple Sensor Configuration sets that may be switched manually. You can edit each Configuration separately and store them inside the System Profile. Switch configuration in the General item of the System Profile. Max. String Capture Length Truncates all captured strings to this maximum length. This prevents overhead from excessively long strings. Capture CPU Times Enables CPU Time Capturing. If set to Automatic, the Agent may disable CPU Time Capturing if estimated overhead is too high. PurePath Percentage Reduces percentage of captured PurePaths. For example, setting this to 50% only starts one out of every two PurePaths. This option reduces overhead from excessive PurePaths, but produces less data. inactive Invisible inside an existing PurePath. active Visible inside an existing PurePath, but this Sensor is not en entry point for new PurePaths. active and start PurePaths Visible inside an existing PurePath and start a new PurePath if not yet started. JDBC Sensor allows to enable bind value capturing. Exception Sensor allows to include/exclude specific Exception classes or capture stack traces. JMS Sensor allows to capture message content. 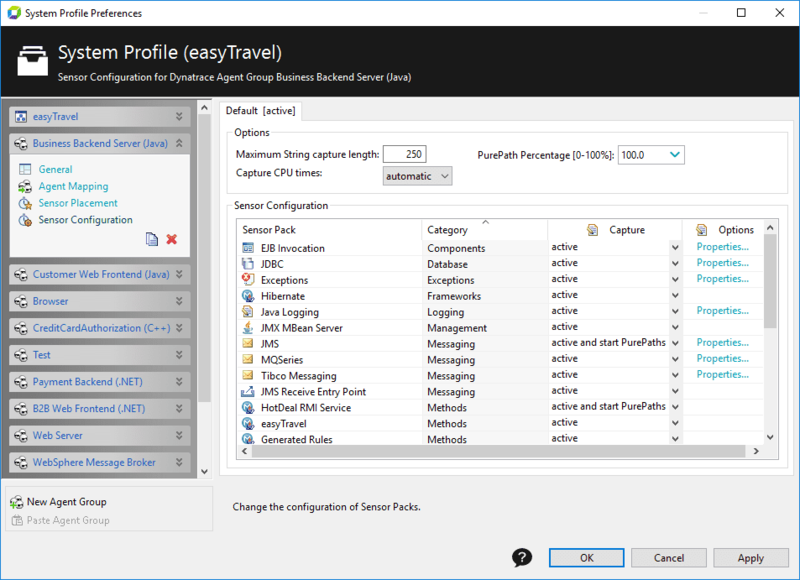 WebService/Servlet Sensors allow to capture request/response sizes. See Usage of Agent Groups for more information.